Thyrodine is potassium iodine supplement. Just one drop provides you with 210 mcg of iodine. 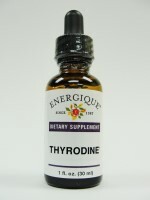 Iodine is a key nutrient for thyroid function, and is recommended for radiation toxicity.